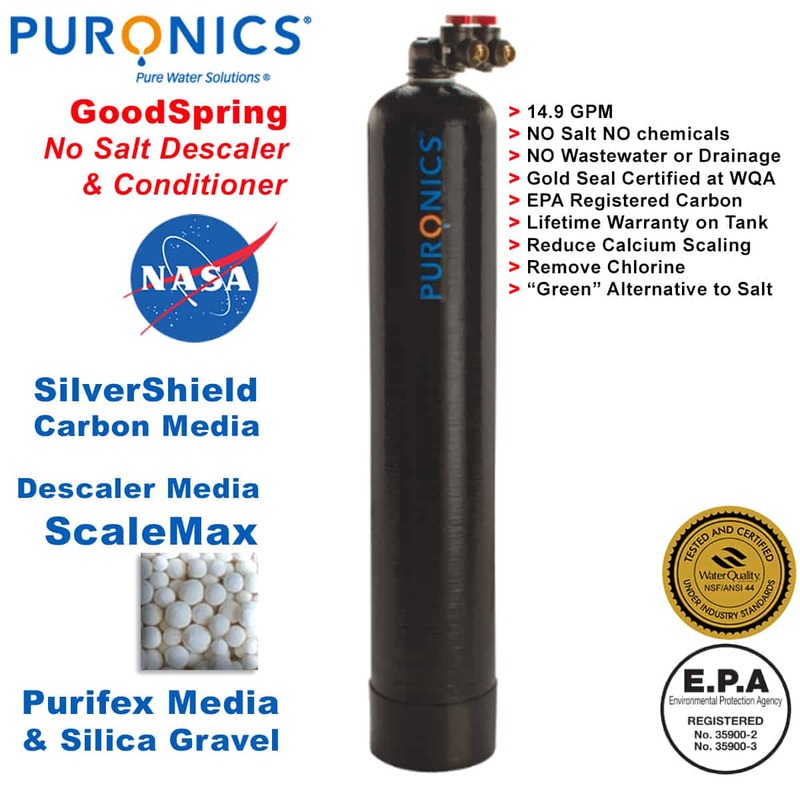 The Puronics GoodSpring is a whole home water descaler and water conditioning system which requires NO salt. The GoodSpring is a “Green” water softener alternative. The ScaleMax media leaves the Calcium Magnesium in the water, but it alters the ability of the minerals to stick, scale and buildup. The system includes SilverShield carbon media and Purifex media, resulting in extremely clean water. Puronics is celebrating their 70th anniversary, manufacturing water treatment systems in the USA since 1947. Millions of Puronics water conditioning systems are installed all over the world, the technology is proven and true. 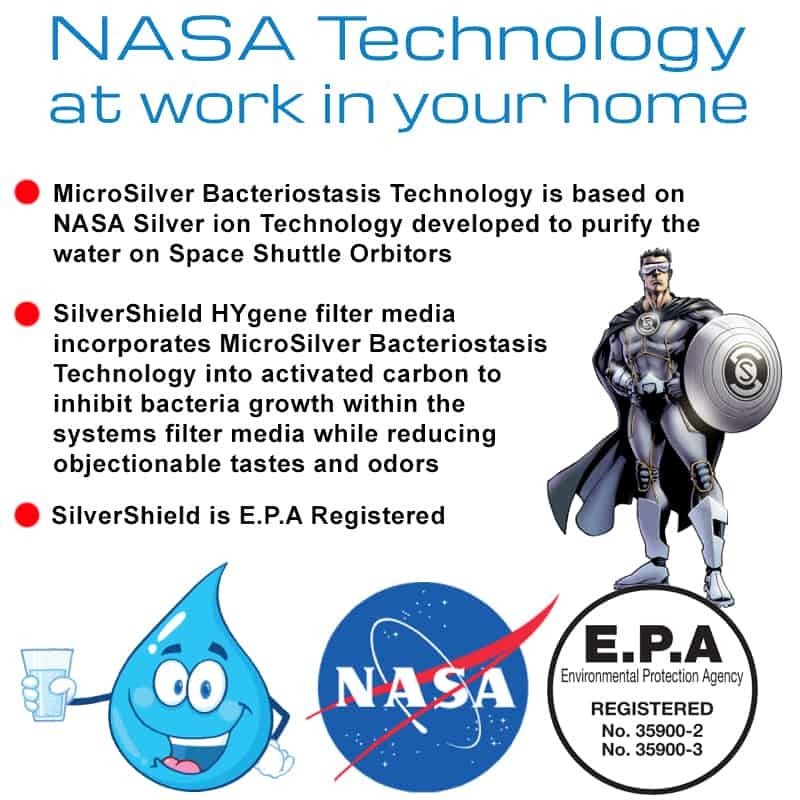 The Puronics Defender features SilverShield Carbon, which has NASA Silver Ion Technology infused with the carbon, this prevents bacteriostasis inside the tank and also helps produce superior quality water. SilverShield was co-developed by NASA and Puronics in 1981 to treat the water on the Space Shuttles and Orbiters. The carbon itself is high absorption carbon which eliminates tastes and odors from the water which may result from chemicals like chlorine or chloramines used by cities and municipalities to treat the water against germs and bacteria, as well as removing other impurities which may exist in the water from contaminants which may have seeped into the ground water from agricultural waste, industrial waste or mineral deposits. Call Us Today (800) 836-3987 to set up a FREE Water Test in your home, at which time we will also evaluate how a system would be installed and provide you with accurate pricing. You can also bring a sample of water from your home to our water lab at 106 Mantua Blvd. Mantua, NJ and meet our team. © 2017 Orbit Energy & Power LLC. All Right Reserved.